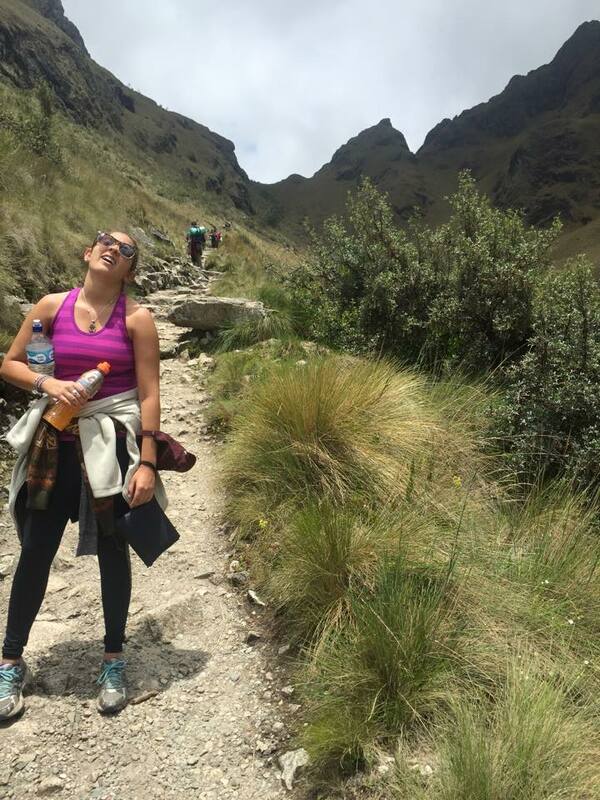 Hiking the Inca Trail is hard. Doing it whilst simultaneously suffering from a stomach virus is something I wouldn’t wish on my worst enemy. I would say that sometimes bad luck follows me. I was already nervous about the 4 day long hike and the altitude, but fate decided to throw a stomach virus at me on day one of the trail. Cusco, 7am. We start the bus journey up to the trail and my nerves have set in. I have had particularly bad experience with altitude sickness already, so I was chugging water like a psycho on our way up to the mountains. My stomach had felt a bit off that morning, but I didn’t think anything of it. Our tour group stopped at a spot for a bathroom break and to get last minute supplies. I picked up an extra sweater and leg warmers, and a rope for my backpack to hold my sleeping bag to my backpack. Although it was January, which meant summertime in Peru, I underestimated how cold it would be once we got higher in altitude. The bus left us off at the entrance to the park and we were handed our sleeping bags and mats, and made sure everything was attached to our backpacks before we started walking. 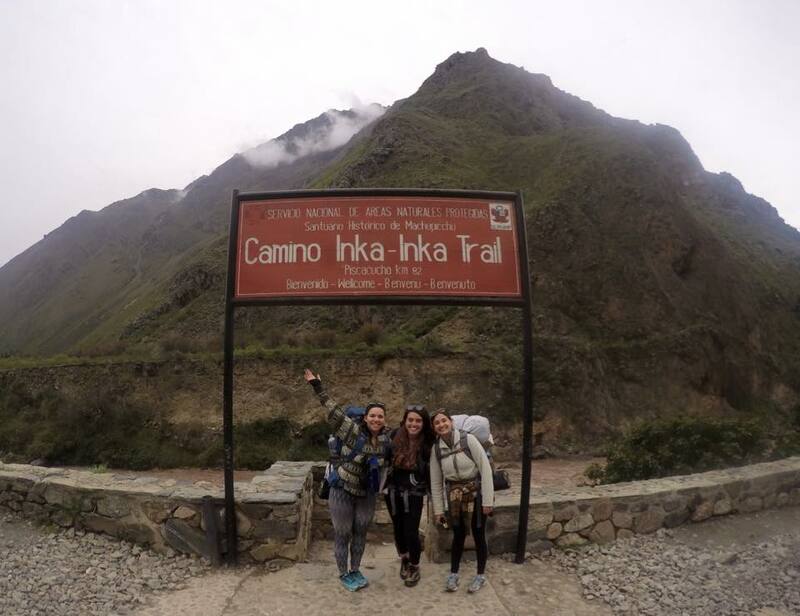 We took a few pictures at the Inca Trail sign, and began our walk into the park. The best souvenir I have from this trip are the stamps in my passport that I’ve collected from the trail. Day one was a lot of uphill walking. A few hours into it and I was feeling good, but I knew something was just a bit off with me. I started feeling nauseas, and eventually had to stop, and got sick. I’ve been exposed to high altitudes before, and I knew that this wasn’t a reaction from that. Every time I took another step, I got sick. It was horrible. Luckily, we had just gotten to our lunch spot. I tried to put down some french fries, but failed. While everyone sat on benches and scarfed down their food, I laid down on the grass, and basically puked my brains out. Lunch was over and we had to continue to get to camp before dark. I put on my bag, took 2 steps, and got sick again. Eventually, everyone on my tour had to take turns holding my backpack, because I couldn’t do it. My two friends that I was with stayed back with me, along with one of the guides. He gave me his walking stick, and his gatorade (which literally saved my life) and I pushed forward. This was one of the most horrible days of my life. Anyone thats ever had a stomach virus knows that you can’t do anything but lay in bed. Now imagine having that feeling, and also having to hike hours up a mountain to get to camp. I actually had no choice. SOMEHOW, someway, I made it to camp, and the throwing up stopped. I was able to put down a little soup, but my stomach still felt so horrible that I could barely eat anything. This day was one of the most physically challenging days of my life. 6 hours of hiking, completely and 100% uphill. It was horrendous. I made the choice to hire a porter to carry my bag, just incase I got sick again. I didn’t want anyone else to have to carry it along with theirs. Best decisions ever. The altitude was so high at this point, almost 14,000 ft. up to Dead Woman’s Pass. This is the hardest and highest point of the trail. The point where you walk 4 steps up and have to stop to breathe. Its insane. My legs have never burned like they did, and it was impossible to catch my breath. When we reached the top, everyone was cheering us on. It was one of the most incredible feelings. I still can’t believe I managed to do it, especially after being so sick the day before. We made it to Dead Woman’s Pass! 14,000 ft up and the highest point on the trail! 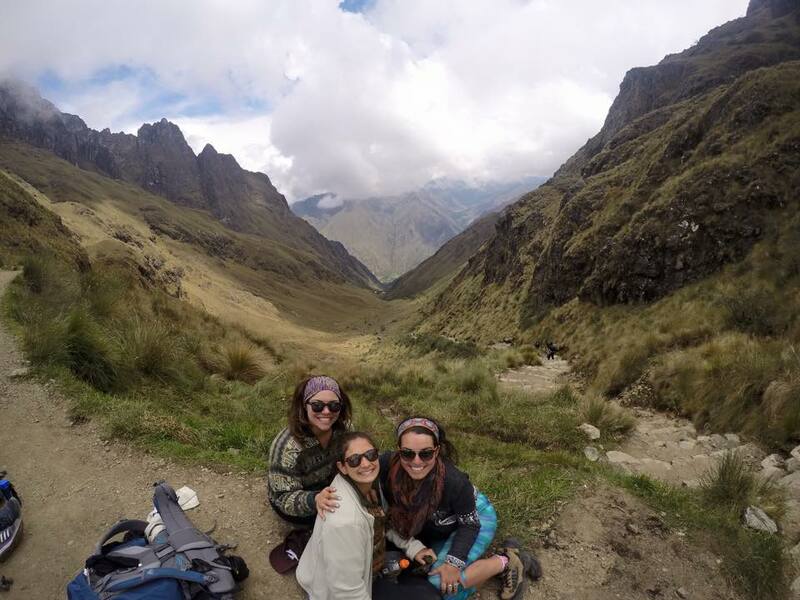 Once we reached Dead Woman’s Pass, we chilled there for about a half hour to rest and take in the incredible views. After that, we had about a 2 hour descent downhill to our camp. The views of the stars that night were breath taking. Because we were so high up and in the middle of nowhere, there was no light pollution. Seeing the milky way for the first time was something I’ll never forget. I remember laying with my legs in the tent and my head out, and I literally couldn’t look away. I was so tired from the day and wanted to pass out, but the stars were so insane, I couldn’t pull myself away. Although I was not throwing up, there were other lingering side effects to my horrible stomach virus that decided to last me the entire trip. 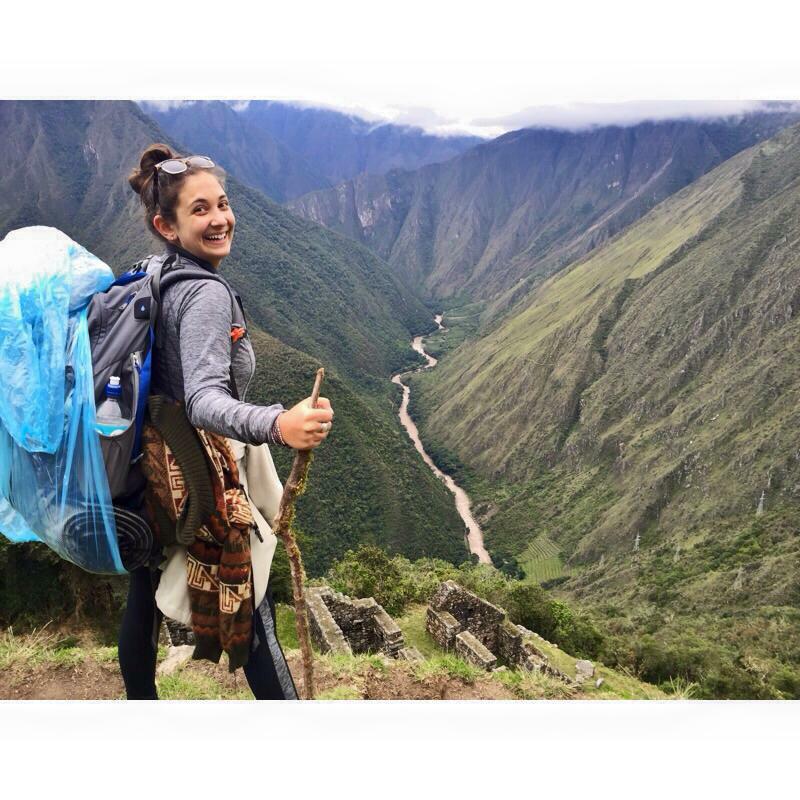 Lets just say that the “bathrooms” on the Inca Trail are non existent. And when you do come across a rest spot with a “bathroom,” its a wooden enclosure with a hole in the ground and no toilet paper. Good thing I was prepared with my own. Day 3 was up and down. I had my backpack this day, and at this point in the trail you start to descend from a Cloud Forest environment into the Rainforest. I remember looking at all of the life around me and being in awe. I’ve never seen leaves the size of my body before, or been in that type of environment. 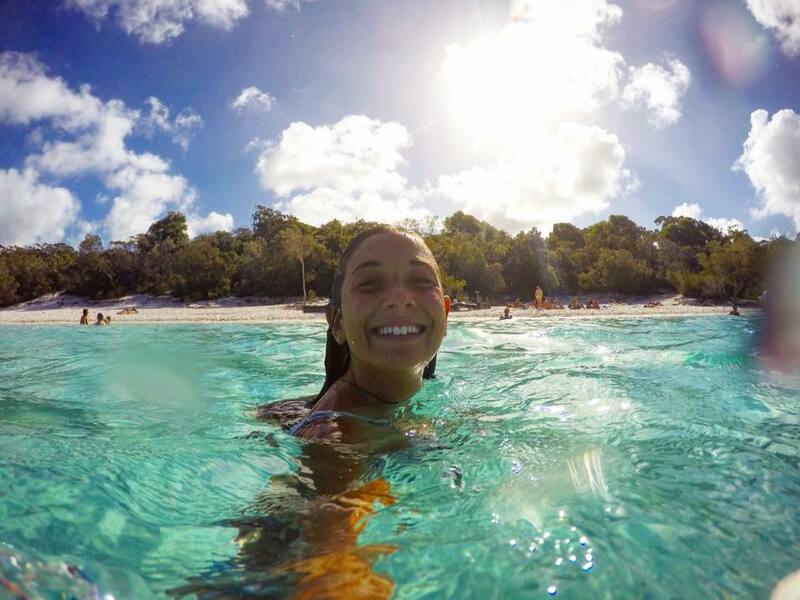 What an incredible experience it was to be surrounded in nothing but untouched nature. We also ran into a couple alpacas this day and managed to get a few fun photos of them. 3:30AM wake up call. Our headlamps were strapped to our heads, and we were ready to hike the remaining 3 hours in the dark so that we could witness the sunrise over Machu Picchu. This, of course, was the only day that it decided to rain. I was prepared with a rain coat and a poncho, so I managed to stay pretty dry (minus my hair). Dawn broke and there wasn’t much of a sunrise as it was still rainy and cloudy. 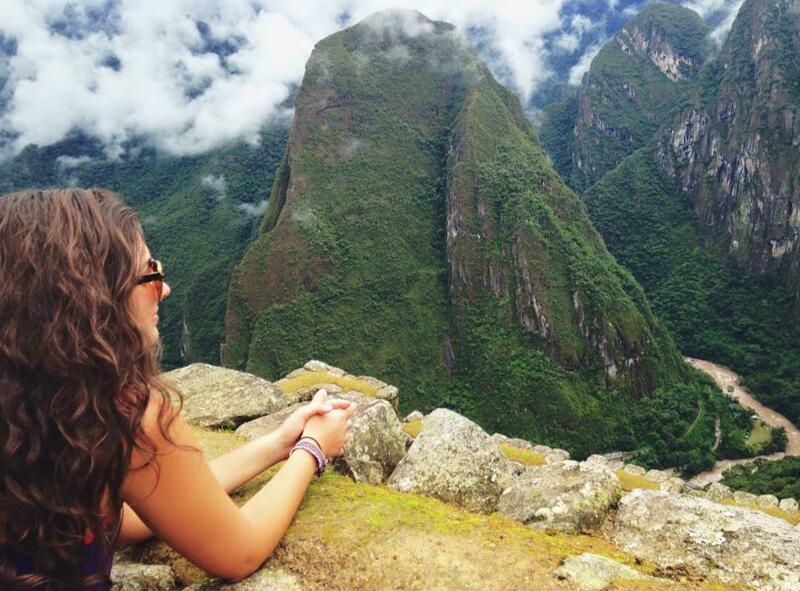 We finally arrived at the viewing point for Machu Picchu, a few more steps and we were there. What did we see? Nothing but clouds. Anticlimactic is the right word to describe this moment. It was a serious let down. 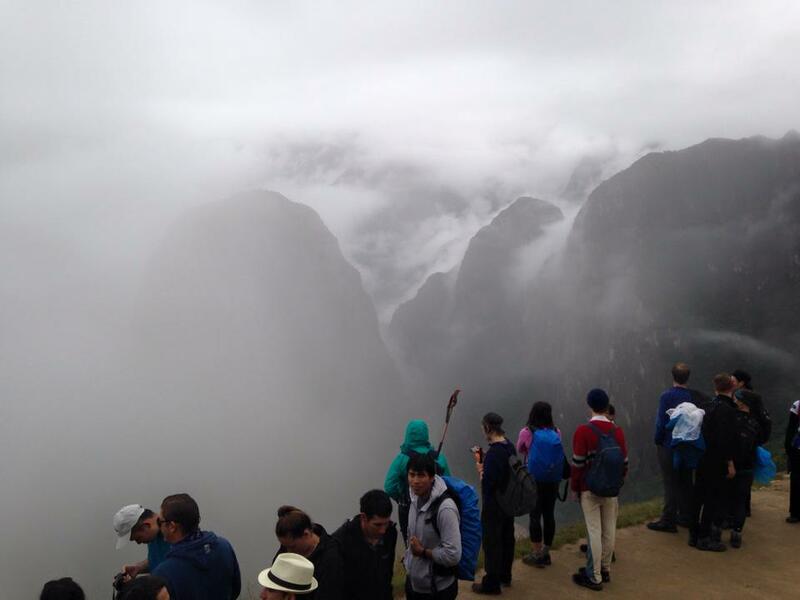 We had hiked for 4 days for this moment, and Machu Picchu was completely engulfed in fog and clouds. Luckily- about 45 minutes later the rain stopped and the clouds vanished. What we were left with was spectacular. 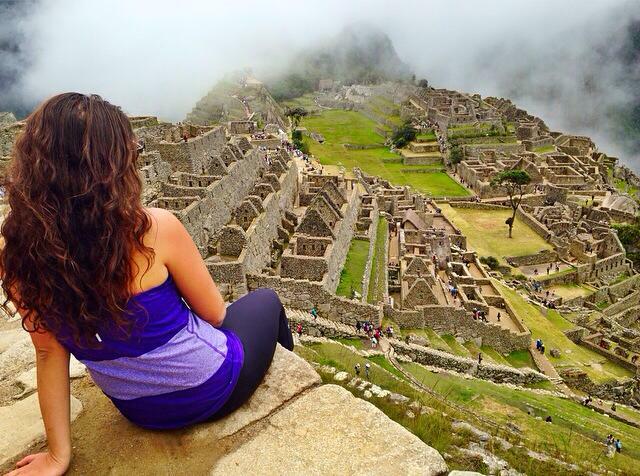 Machu Picchu is definitely one of the most incredible sights you’ll ever see. We took our time and explored the ruins, and made sure to get some good photos. It was about mid afternoon by this point so we hopped on the bus and train back into town. BOY was I happy to finally get a nice meal at a restaurant and a bed. 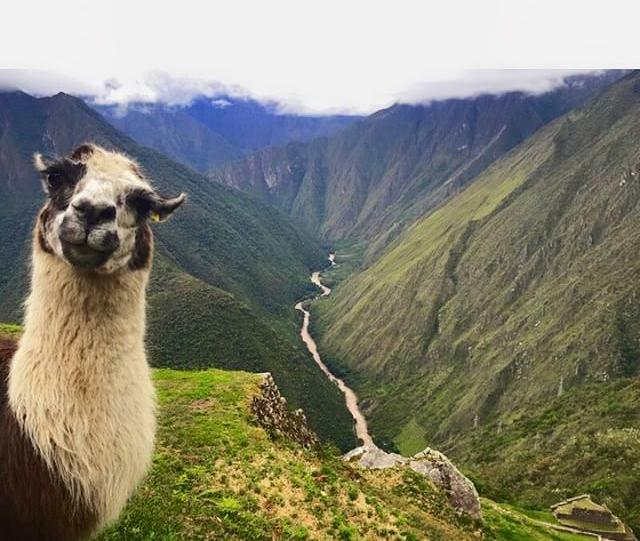 My experience hiking the Inca Trail was one i’ll never forget. Although I was unlucky and was quite sick for most of it, I wouldn’t trade it for anything in the world. 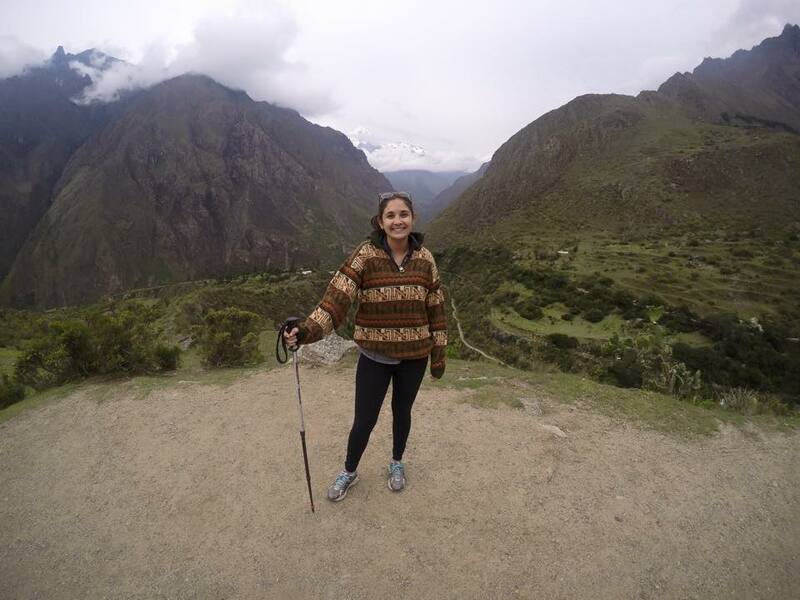 It was my first time doing a hike that long, my first time being in a rainforest environment, and my first time being immersed in a culture that was so very different from mine. I loved every bit of that trip, and I’m so grateful that I was able to share the experience with my two good friends.